2N EasyGate is a NEW type of analog GSM Gateway (Fixed Cellular Terminal) from 2N's portfolio. Because of its features it is suitable for small companies, which use it for saving costs of calls to GSM, SMS sending and GPRS Internet connection. For medium size companies we recommend Omikron Multichannel Analog GSM gateway. The analog 2N EasyGate gateway has been designed not only for Voice transmission between your PBX and GSM networks, but also for Data, SMS and PC Fax transmission between your PC (LAN) and GSM networks. Using this gateway you can half your company telephone bill since all calls directed to GSM networks are routed through EasyGate and extortionate bills for the PSTN-GSM connection are avoided. The EasyGate Gateway is not only a tool for call cost reduction as it can provide other communication solutions such as sending and receiving SMS and PC fax messages, thanks to the GPRS you can browse internet and send e-mails, thanks to the FSK feature you can see the calling party on the phone (if supported by the telephone) - all these features are supported by the 2N EasyGate GSM Gateway. Serial port for GPRS connection enables e-mail communication, Internet browsing and PC faxes sending and receiving. These means of communication are widely used on boats and in distant areas. 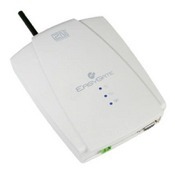 Installation, supervision and maintenance are other eminences of the EasyGate GSM gateway. In case you use prepaid SIM cards, you obtain automatically SMS message about low credit on the SIM card. Other smart feature which is highly appreciated is a periodical gateway status SMS message, which informs you about the current signal, number of calls, etc. NEW complementary 2N product - EnergyBank - is a back-up power supply that can be used with any equipment requiring 12V supply. With this product, any 12V equipment can work for a substantially longer period of time without stable feed. The CLI (Calling Line Identification) i shown on a connected phone set that supports the CLIP. The CLI can also be also shown on phones connected via a PBX. The CLI of the SIM card in the gateway can be hidden for outgoing calls. EasyGate is a solution for voice, data and SMS communication, ideal for home offices. EasyGate is also an ideal solution also for mobile offices. EasyGate supports SMS sending and receiving. The 2N SMS server users can also send SMS among each other.